When you take on a home repair, remodel, roofing project or cleanout, it can generate a lot more waste than usual. To help manage the mess, We offer open-top roll-off containers for rent in 10,20, 30 or 40 cubic yards and concrete 20yd dumpsters. They can be used for all levels of non hazardous waste collection, as well as recycling collection. If you haven’t already, sign up at Waste Pro Rewards to start saving on disposal service bills. This program rewards residents who recycle on a consistent basis. It’s free to participate. Learn more about the recycling rewards program at the City of Daytona Beach website. Bring these wastes to the Tomoka Farms Road Landfill. There’s also a paint exchange program run at this facility. Call the landfill at 947-2952 for more information. Contact the Solid Waste Management Division at 386-671-8670 for questions regarding garbage and recycling in Daytona Beach. Landfills usually charge by the ton and that cost will get passed on to the individual booking the roll-off dumpster. The landfill fees in one city could be anywhere between 3 and 4 times the cost in a another city, which substantially impacts rates. Heavy waste material like construction waste or roofing shingles will be more expensive to get rid of than lighter general every day debris. When the construction debris or shingles are recyclable locally, then that type of waste might actually be cheaper than general household rubbish. Generally, the price to dump at a recycling station is significantly less compared to the price associated with dumping in a landfill. Gasoline costs and also the location of the location where the debris container will be delivered influence rental prices as well. If the location is far away from a recycling center or landfill, then the transport expense is likely to be more. Recycle Florida Today (RFT) takes a proactive approach to boosting recycling rates and overall sustainability in the State of Florida. It keeps the public informed of recycling legislation and laws pertaining to recycling in the State. It also hosts an annual conference to help bring together leaders in the recycling industry in an effort to exchange ideas, improve recycling technology, and to further the State’s progress toward reaching its 75% recycling goal. The city has a contract with Republic Services to handle all residential curbside trash hauling services, including trash and recycling pickups. It also offers commercial dumpster service. You may rent a dumpster from a privately –owned dumpster rental company as long as they are licensed to operate within city limits. You will probably need to secure a permit if the container is to be placed in the public right-of-way, such as a city street or alleyway. Check with your dumpster rental provider to see if they handle permitting requirements for you or if you need to fill out the permit application yourself. ***More information about permits here. Dumpsters come in all different sizes throughout Florida. The key is to get one large enough to handle all of your waste, but not so big that you pay for more than you need. This is always going to involve a rough guess on your part, but there are rules of thumb to make that guess an accurate one. Here’s an easy guide to help you choose a dumpster that will work for you. You can also just call (407) 279-3090 and we would be glad to help you with the dumpster renting process. We have dealt with every imaginable kind of project and they know what will fit in each size dumpster. Some of our trucks cannot pick up an over-loaded dumpster, so it’s important to get the right size. Is the City of Orlando franchised for solid waste collection? Yes, the City of Orlando, FL maintains a non-exclusive franchise for solid waste collection and roll off container/compactor services. There are a list of more than 25 haulers that are licensed, qualified and insured within the City Limits. We support this list of franchised haulers? Yes. We work within the list of franchised haulers for the City of Orlando. Please advise that the list of approved haulers on the Public Works website may or may not be the updated version. Our Temporary Roll-off Containers and Permanent Self-Contained/Compactor Roll-Off Rental Services are available in all the surrounding counties. We perform our waste collection services with state-of-the-art equipment, operated by highly skilled waste handling experts. Our roll-off trucks are equipped with top of the line hoisting and self-tarping mechanisms. On-Line account information and rental payment options available. Clean, safe, efficient, and on-time professional service regardless of where you are or the size of your business. Temporary roll-off dumpster containers are perfect for the removal of trash, new construction, remodeling, demolition and land clearing debris, as well as concrete removal. We offer a variety of sizes to suit your unique needs. As part of our commitment to exceptional customer service, we equip all of our trucks with the latest GPS tracking & location systems. We also equip specific trucks with video camera systems that provide real-time streaming and imaging. Arwood Waste leases, sells, and services a variety of compaction equipment, or if you own your compactor, Arwood Waste can service it for you. Compactors are fully enclosed waste containers that utilize a mechanical “corkscrew” within the container to compact the waste to maximize the amount of materials that can be loaded in it. Most customers that utilize a compactor generate a high volume of waste or recyclable material and use to their advantage zero airspace in a load of debris. The immediate cost of a compactor is higher than open top roll off containers; however, the investment is rewarded though savings in the reduced number of hauls needed. Furthermore, commercial and industrial customers that use Arwood’s for compactor service are receiving the guaranteed best customer service in the industry, the most competitive pricing, and the most well maintained equipment. We are the Franchised Hauler, committed to providing convenient, prompt and affordable dumpster rental services to Duval, Clay, St Johns, Nassau, Baker, Bradford and Union Counties in Florida and Camden and Glynn counties in Georgia we are fully licensed and insured. We offer 15, 20, 30 & 40 yard dumpsters. Our 15 yd dumpster is the most popular size. Our 15 yard dumpster size is generally carried on a single axle rear end truck that is easier on your landscaping and concrete surfaces. Our single axle trucks are lighter residential projects and the larger dual axle Mack trucks demolition and large commercial projects.. Your local team at Arwood Waste Services is devoted to meeting your needs every day. We’re dedicated to providing cost-effective garbage collection, recycling and solid waste disposal solutions for your home, business or government entity. Arwood Waste offers mobile restrooms in North Florida and the South East Georgia. When you take advantage of our portal potty rentals, you will have several options from which you can choose. We offer a variety of units including standard restrooms, high-rise units and deluxe flush-ables.Whether you need one restroom for a few people, or many for a large event, we can help! Nothing is more important to us than customer satisfaction and we are happy to work with each client on a personal basis. No job is too big or too small for our team and we can quickly transport our restrooms directly to your location in the Jacksonville area. Browse our complete selection of mobile restroom units below and choose which one is right for you. We are always here to help when you need us most and we are available to provide our clients with more information at a moment’s notice. For additional details, or to place a rental order, contact us today! Special Event Rentals: Parties, Picnics, Class Reunions, Weddings, Family Reunions, Funerals, Etc. Commercial Special Events: Carnivals, Car Events, Park Rentals, Horse Shows, Sporting Events; Football Basketball, Soccer, Baseball, etc. Arwood Waste’s Restroom Trailers have always been, quite simply, beyond compare. Today they are better than ever by featuring first class accommodations, and providing all the comforts you would find at home. These beautiful luxury restroom trailers feature heating and air conditioning, powered ventilation, house-grade doorknobs, and private stalls. With amenities like televisions, stereos, porcelain toilets, the latest Dyson brand hand dryers, and glass bowl sinks with hands-free features they are sure to delight even the most distinguished guests. You will find we went the extra mile everywhere you look. Arwood’s has even made it possible to have your event more expressive by playing a wedding related video on the televisions, or even play live broadcast coverage of your sports event so your attendees never miss a moment. Every one of our Employees is focused to achieve continuous improvements. 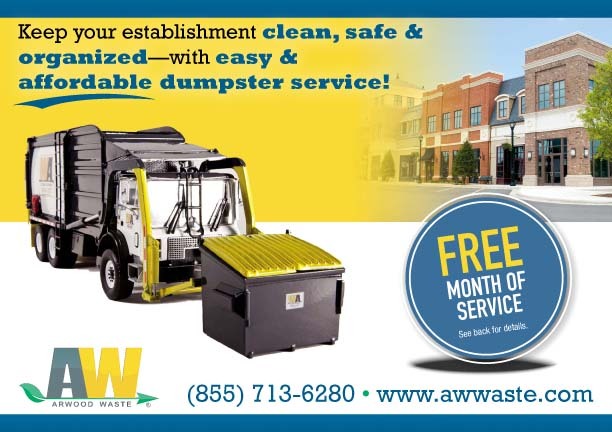 The versatility of the Arwood Waste fleet allows us to be able to serve any Customer need. We are able to provide a comprehensive range of waste collection systems involving a large variety of vehicles and equipment. Each one is specifically designed to provide individualized service to each homeowner or to an entire City. Every facet of our operation is geared toward providing “whatever it takes” to service our Customers demands! The city works with several different waste haulers of which you are free to choose from. You can see the current list here, or call (904) 630-2489 to find an approved waste hauler in your area. To dispose of any waste other than construction and demolition (C&D) debris and recyclables, you are free to hire any licensed roll off dumpster rental company you please. You must choose a franchised waste hauler at the link above to dispose of all other materials. The city doesn’t allow more than 40 pounds or more than 1 cubic yard of construction debris or building materials to be disposed of in household trash. You would have to either rent a dumpster to dispose of the material, haul the material to the landfill yourself or hire www.ArwoodWaste.com to do it for you. Compare the going rate for commercial dumpsters to Arwood Waste and then you will call 904-751-2177 to make the change!